In his May 5, 2013 article in the San Francisco Chronicle, “FCC priority should be faster bandwidth,” Blair Levin contends the FCC should focus on increasing available Internet bandwidth in U.S. communities. He compares available access speeds and prices in United States cities to Japan, which is leaps and bounds faster and cheaper. Levin is correct to argue the United States government needs to adopt policies to promote faster broadband access. The FCC and other government agencies also need to pay attention to continuing policies of draconian content filtering in many public schools, however, which sadly remain opaque or hidden to most community constituents besides students and teachers. While some school districts have adopted more balanced approaches to content filtering in the past several years, allowing teachers to bypass content filters and allowing greater student access to websites for interactive publishing, we still have a long way to go. The FCC and other government agencies could do a lot of good by promoting research and amplifying research that highlights these restrictive content filtering policies in some schools. As educators and advocates for blended learning in our schools, we need to find ways in upcoming months to highlight the digital divide that continues between school and business Internet access in the United States. Many school districts and school leaders continue to resist the imperative to help learners of all ages become responsible publishers online. As more educators work to Map Media to the Common Core in the years ahead, hopefully these dynamics can constructively change without intervention from the federal government. 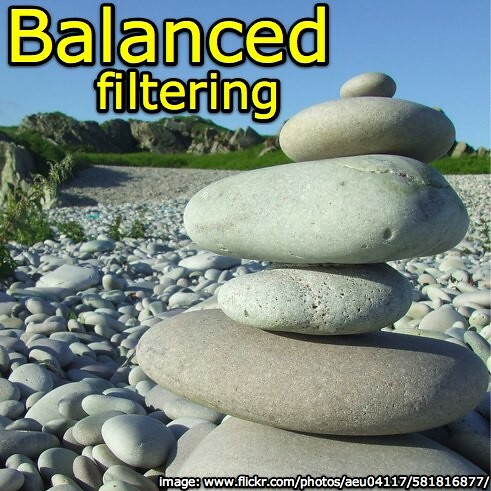 If you are an academic researcher or someone interested in research to promote improvement in schools, consider researching the need for balanced filtering in education. Hat tip to Doug Levin for sharing this article link via Twitter. This entry was posted in Uncategorized on May 6, 2013 by adminwf. Take a balanced and reasonable approach in expeditiously responding to “unblock” requests from teachers and staff. Here’s my situation today: I accessed the Twitter profile of a new colleague, and bypassed the district content filter to access Twitter. (Remembering my userid and password was a challenge, but I did it!) I next encountered a link shared by someone who follows my colleague that I wanted see. The problem was: That link was shortened with the URL shortener service bit.ly, and even with a teacher content filter bypass I can’t access bit.ly on our district network. Enter unshort.me. This website (which is NOT blocked on our district filter) allows users to “unshorten” or resolve shortened URLs to their full, original web addresses. By using unshort.me, I was able to link to the PDF program for the August 29th Smart Start Oklahoma conference as well as see their website address so I could truncate it (remove the directory names and file names after “.org”) and visit their homepage: www.smartstartok.org. The website unshort.me is a helpful one for your digital teacher toolkit. What other websites or techniques do you like for working around a situation like this with shortened URLs blocked by a school district filter? This entry was posted in Uncategorized on August 20, 2012 by adminwf. eSchoolNews’ August 17, 2011 article, “ACLU sues Missouri school district over internet filtering,” provides details about a new lawsuit filed by the American Civil Liberties Union against the Camdenton R-III School District in central Missouri. The lawsuit is part of the ACLU’s “Don’t Filter Me” campaign. Camdenton Schools are accused in the lawsuit of prejudicially blocking students’ access to educational websites about gay, lesbian, and transgender issues, while providing access to anti-LGBT sites. The lawsuit argues it is discriminatory and unreasonable to require students to ask for permission every time they want to access a new LGBT website when students can freely access anti-LGBT websites. …has a viewpoint-discriminatory category called “sexuality,” which blocks all LGBT-related information, including hundreds of materials that are not sexually explicit. The filter does, however, allow students to view anti-LGBT sites. The following video provides an explanation, targeted at students, for how they can help in the “Don’t Filter Me” campaign. It is very important for school officials to understand the laws in the United States related to Internet content filtering as well as the importance of not “over blocking” web content. As I’ve written and noted previously, some of our U.S. schools filter Internet content more severely than China. This is a big problem, and should be addressed for a variety of reasons. I started the projects “Balanced Content Filtering in Schools” and “Unmasking the Digital Truth” to help address these issues. I also included an appendix in my July 2011 eBook, “Playing with Media: simple ideas for powerful sharing” on “Balanced Content Filtering in Schools.” The issues here go beyond LGBT website access. In the United States, we ideologically support free expression and the marketplace of ideas. We recognize the need to censor certain kinds of content on the Internet in our schools and libraries, through the CIPA law, but that mandated censorship is still LIMITED. It will be interesting to follow this case and see how this develops. Hopefully one outcome will be more balanced approaches toward content filtering in Camdenton Schools and elsewhere. This entry was posted in Uncategorized on August 20, 2011 by adminwf. 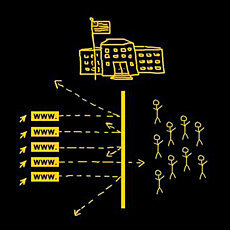 CIPA is the Children’s Internet Protection Act and applies to all U.S. schools and libraries (both public and private) which receive federal E-Rate funding. Here is the clarification I’d like to offer: There is no such a thing as “CIPA compliant content” or “non-CIPA compliant content.” There obviously IS content online not appropriate for school, but that determination is not made by the CIPA law, it’s made by local authorities. CIPA requires that each school or library subject to E-Rate rules have a filtering policy in place and enforce it, but it does NOT definitively state specific videos and other webpages which should be blocked and should be accessible on school networks. Tina Barseghian’s recent post, “Straight from the DOE: Dispelling Myths About Blocked Sites” (highlighted in the BalancedFiltering.org post, “Do your school administrators REALLY understand CIPA?”) is an excellent article about these issues. Words matter, and we need to be careful that our discussions about content filtering, CIPA, e-Discovery, FERPA, COPPA, etc. clarify requirements rather than confuse people. It is confusing to say, “My Big Campus” keeps your school CIPA compliant by filtering out non-CIPA compliant YouTube videos. CIPA requires a content filtering policy and enforcement of that policy. CIPA does not define “compliant / non-compliant YouTube videos” or other content. Teresa also said: “WikiPedia is a site of hotlinks, and students can quickly get to inappropriate content” from WikiPedia articles. She then advocated for how Lightspeed Systems lets teachers whitelist (allow on the content filter) just a specific WikiPedia page, but then every hyperlink on that page is blocked from student access. I have big reservations about this. I understand Lightspeed Systems is a vendor and is creating a product to meet consumer demands, which include IT personnel who want to overblock the web for students and teachers far beyond what is required by US law. I also understand a system in place which lets teachers directly unblock websites for student access, and specifically whitelist websites for student access, is a HUGE leap forward from the “digital prisons” in which many of our K-12 learners live today at school. LightSpeed Systems is a big company and has a lot of clout. Terrisa said Alan November as well as Kevin Honeycutt are now presenting on behalf of LightSpeed Systems at educational conferences. I am very appreciative of Terrisa’s session today, but I think it is very important to be careful and scrutinize the words and phrases we use to discuss these issues. These aren’t minor points. The issues here are both technical and human. Schools need policies in place to protect students and comply with CIPA as well as other laws. There is a significant difference, however, between protecting students from objectionable content and trying to stop all students from searching for anything inappropriate online. We also have obligations as educators to help students use sites besides Google Images which are copyright friendly and less inappropriate image content. I’m tackling that issue tomorrow at the conference in my breakout on Pecha Kucha presentations and ending PowerPoint abuse. LightSpeed Systems has some good products and services. The ability for IT in your school/district to have access to bandwidth utilization graphs as well as data like that shown below by Terrisa in our session is vital. Many of our smaller/rural schools don’t have this kind of capability and need it. In Oklahoma, NewNet66 is a great organization putting tools with similar features in the hands of its member school educators. I’m really interested in advocating for more balanced content filtering in our schools. LightSpeed is doing some good things to address overblocking, but I’m concerned about advocacy which would push everyone onto the “closed web” and discourage learners from publishing on the open web. See my notes from Karen Fasimpaur’s session, “Open Educational Resources: Share, Remix, Learn” at the 2011 ISTE conference for more on that topic. I’m also concerned with definitions of WikiPedia like “it’s mainly a hotlist of inappropriate links” which perpetuate misconceptions about the site rather than clarifying what the value of the site is and how it should be used AND authored by our students. I’m finally concerned about phrases like “CIPA complaint content” which are misleading and do NOT help others better understand the actual requirements and terms of the CIPA law. What’s your take on these issues? This entry was posted in Uncategorized on August 2, 2011 by adminwf. Do your school administrators REALLY understand CIPA? Accessing YouTube is not violating CIPA rules. Websites don’t have to be blocked for teachers. Broad filters are not helpful. Schools will not lose E-rate funding by unblocking appropriate sites. Kids need to be taught how to be responsible digital citizens. This entry was posted in Uncategorized on May 6, 2011 by adminwf. What websites should be whitelisted on school content filters? Many of our public schools in the United States today “overblock” the web and prevent both students and teachers from utilizing powerful, interactive tools which can assist in content creation, collaboration, and sharing as well as constructive, on-task digital learning. To promote more balanced filtering of Internet content in Oklahoma schools, Eric Hileman (the Director of Instructional Technology/Telecommunications at the Oklahoma State Department of Education) is soliciting input from educators everywhere via Google Forms to share websites EVERY school should permit on their network, and the reasons why. 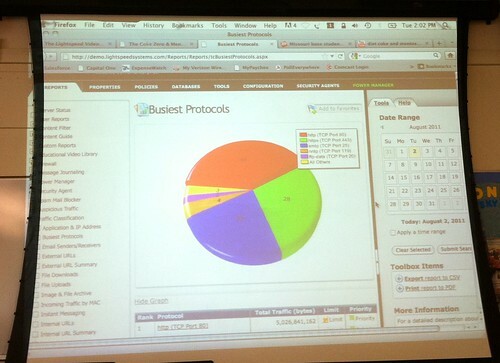 This Google Form is accessible from bit.ly/whitelistsurvey, and results are also viewable publicly. If bit.ly is blocked in your location, this is the direct link to the Google Form. Eric is going to continue sharing the results of this survey via Twitter, and I hope to amplify those results both here on BalancedFiltering.org as well as my primary blog, “Moving at the Speed of Creativity.” Please share this project and these links with others. This is a great project and the shared results could prove extremely useful for schools everywhere, not just in Oklahoma. This entry was posted in Uncategorized on January 13, 2011 by adminwf. On October 29, 2010, I shared a five minute “lightning talk” at OpenBeta5 in Oklahoma City at the Co-Working Collaborative, making a passionate case for why we need balanced content filtering in our schools. Thanks to the videography work of Opus Video Productions, that presentation is available on YouTube. See my October 29th post, “#OpenBeta5 and Ideas for the Balanced Filtering Online Gradebook,” for more background, along with the referenced websites from the presentation balancedfiltering.org and Unmasking the Digital Truth. One of my top new year’s resolutions for 2011 is getting this “Grade my school content filter” web application built and offered free for teachers, students and parents around the United States to begin using to catalyze change in support of balanced Internet content filtering in our schools. I’m submitting this talk as a proposal for TEDxOKC on April 8, 2011. By that time, I hope the “Grade my Content Filter” web application will be available for use! Follow this project on Twitter: @balancedfilter! This entry was posted in Uncategorized on December 15, 2010 by adminwf. At the end of the day, businesses, when a consu… when a user—let me not use the word “consumer”—when a user comes into work and asks for something over and over, IT’s going to have to give it to them. Now, do I expect the user to come in and say they really want their company to use SQL Server versus Oracle? No. But anything the consumer can use at home, they will develop a point of view on and ask for it at work. And eventually, IT will give it to them. I think this quotation is potentially very instructive. Does your IT department block your access and student access to a particular blog or wiki tool now? Write up your request to have it unblocked and explain the reasons why. Then, if the request is turned down, submit the request again a month later. There is a Biblical parable which comes to mind in situations like this. It is sometimes referred to as the story of “The Friend at Midnight.” You can find it in Luke 11:5-13. The lesson is, persistently asking for reasonable things gets results. This is most likely true with school IT departments as well, especially when requests are submitted professionally, with logical and clear explanations, and repeatedly. This entry was posted in Uncategorized on November 22, 2010 by adminwf.